POSTED: Wed, 05/13/2015 - 16:00 | POSTED BY: Traci C.
Disney Parks pin collectors and traders have a new way to enjoy Disney pins when they aren't actually in the theme parks. The all-new Disney Parks Pack Trading Edition pin boxes are arriving at the Disney Parks online store this week. The Disney Park Pack is an online exclusive box of pins that includes a limited edition pin that's only available as part of the pack, and two open edition pins that arrive in the Park Pack before it debuts at the theme parks. Each Park Pack limited edition pin will have a low edition size of just 500 pins making it a true collector's item. The limited edition pins are part of a series and might include characters from animated films or Disney Parks attractions. They'll also feature two embellishments. The pins in the Disney Park Pack are top secret and will be a mystery each month. The first Park Pack will be released tomorrow, May 14, and then each month a new pack will be released on the first Thursday of every month. The Park Packs retail for $39.95 including shipping. There are no refunds or exchanges on the Park Packs. 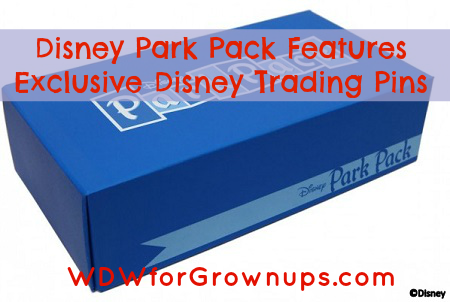 Will you be purchasing a Disney Park Pack Trading Edition? Leave us comment and let us know what you think about these new pins. I appear to have successfully ordered my Disney Park Pack this morning. I'm very interested in and excited by this new program but I just wish that they had a standing subscription service. I nearly forgot to check out the website to place my order this morning! Disney tends to funnel transactions like these through the online Disney store even though it was never designed for these types of products. My wife ordered the limited edition Horizons t-shirts that were cancelled a few days before Christmas, and then magically arrived 2 months later. At this moment the pins product has been disabled, the link is a # (anchor), and doesn't even tell me it's out of stock or what.